Buy all 6 vidoes and save Money! A must have resource for coaches! Running Back Skills and Drills Learn the techniques and strategies employed by those playing the running back position at the highest level. In this comprehensive video, Coach Garet Chachere provides numerous tips, techniques and drills to give coaches and players the tools they need to be successful. Among the topics covered are: disadvatage reach, 6 point explosion, shimmy strike, staggered strikes, gap exchange, the push press drill, the mirror drill, hand placement drill, push by drill and counter, the bull rush counter, the swim rip counter, burner blocker drill, 3-on-1 drill, ball shuffle drill, read the hat drill, transition drill, star drill, jump cut drill, shuffle and stretch cuts, cut drill, overrun drill, 50 pumps drill, strip drill, towel drill and stiff arm spin drill. Each area of the game is taught in a very detailed and easy-to-understand manner. 69 minutes. Wide Receiver Skills and Drills Learn the the techniques and strategies employed by those playing the wide receiver position at the highest level. In this comprehensive video, Coach Steve Mooshagian provides several tips, techniques and drills to give coaches and players the tools they need to be successful. 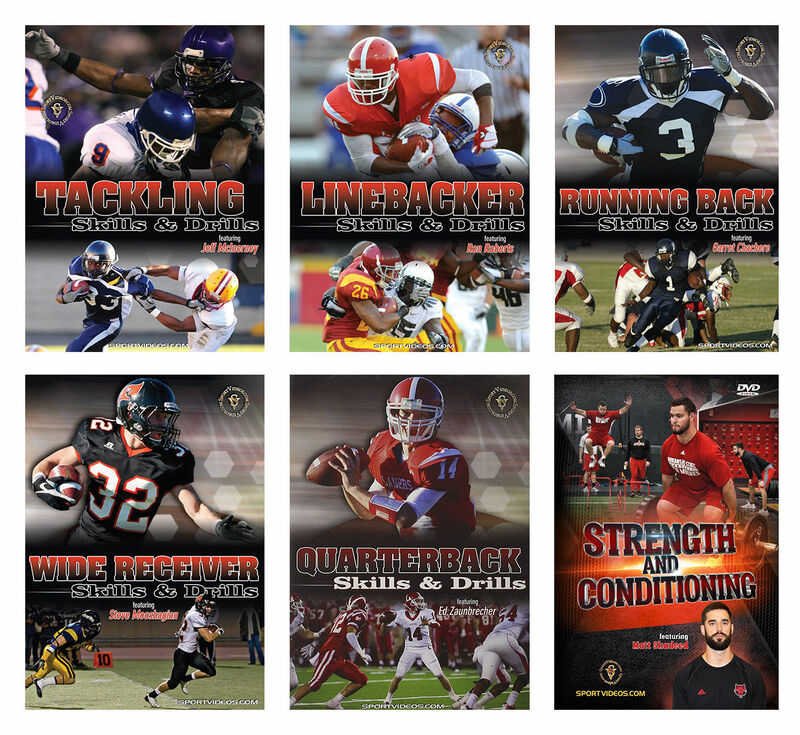 Among the topics covered are: stances and starts, escape moves, numerous drills, routes and conversions, and screens. Each area of the game is taught in a very detailed and easy-to-understand manner. Quarterback Skills and Drills Learn the the techniques and strategies employed by those playing the quarterback position at the highest level. In this comprehensive 95-minute video, Coach Ed Zaunbrecher provides numerous tips, techniques and drills to give coaches and players the tools they need to be successful. Among the topics covered are: basic fundamentals, throwing mechanics, drops, moving in the pocket and specialty throws. Each area of the game is taught in a very detailed and easy-to-understand manner. 95 minutes. Tackling Skills and Drills Knowing how to tackle properly is essential for every football player at any level of competition. In this comprehensive DVD, Coach Jeff McInerney provides coaches and players with numerous tackling fundamentals they need to be successful and safe. Among the topics covered are: hip extension and leverage, front tackle, angle tackle, wrap and roll, ankle sweep, chase tackle and angle pursuit tackle. The skills and drills are taught in a progressive and easy-to-understand manner. This video will help you understand and implement safe tackling methods. 58 minutes. Linebacker Skills and Drills The linebacker position is vital to creating an effective defense at any level of competition. It is imperative that linebackers be in the proper position, be under control, and make the tackle. In this comprehensive video, Coach Ron Roberts presents proven techniques to developing outstanding linebackers. Among the topics covered are: footwork, block pro, tracks, pass, the 9 technique and tackling. The skills and drills address the key factors involved in sound linebacker play. Each drill is explained and demonstrated in detail. This video will help coaches at all levels teach linebackers the skills needed to achieve success. Strength and Conditioning DVD A proper strength and conditioning regimen is an essential part of developing healthy, resilient high-performing athletes. In this video, Matt Shadeed demonstrates the ins and outs of the Arkansas State football strength and conditioning program. Among the topics covered are: Weight Room Warm Up, Stationary Dynamic Warm Up, Dynamic Warm Up, Dynamic Linear Improvement Drills, Multidirectional Movement Skills, Plyometric Progressions, Power Clean Progression, Squatting Variations, The Split Jerk Exercise, The Trap Bar Deadlift, Upper Body Auxiliary Exercises and the Pillar Protection Program This video is an invaluable resource for coaches and athletes looking to elevate their training program to a new level! 114 minutes. 2017.